Experienced travelers who want a more European cruise experience and open-minded cruisers looking for a beautiful ship at a great value. Foodies and cruisers who love lots of attention from crew members. MSC Seaside represents MSC Cruises' biggest and splashiest entry into the North American market yet. The first MSC ship to be named outside of Europe, MSC Seaside was christened in a star-studded ceremony in Miami in December 2017. Seaside brings a taste of the Mediterranean to the Caribbean but offers a somewhat more "Americanized" cruise product than her predecessor in Miami, MSC Divina. This is an important distinction, as MSC's upscale European atmosphere was off-putting to some American passengers who were more accustomed to a raucous party ship at this price point. 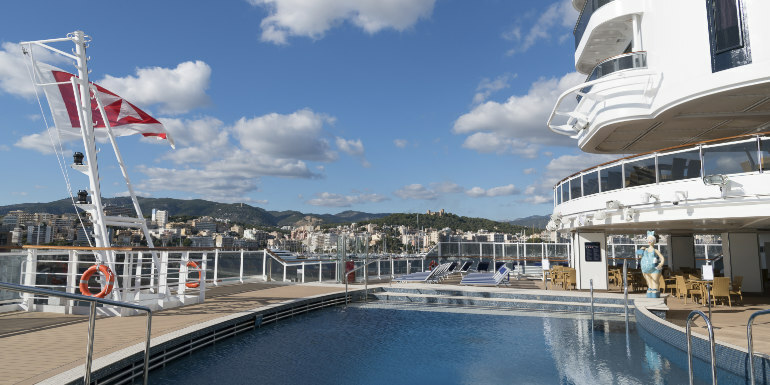 Some of the Mediterranean flair remains, however, and MSC Seaside offers a compelling option for experienced travelers looking for a different choice than what's offered on mainstream lines like Carnival, Royal Caribbean or Norwegian. The ship itself - the hardware - is gorgeous, but the software -- particularly the service and food -- generally fall short of expectations. These two critical areas have bedeviled MSC's efforts to gain a foothold in North America. Early reviews echo our experience during a short preview cruise. 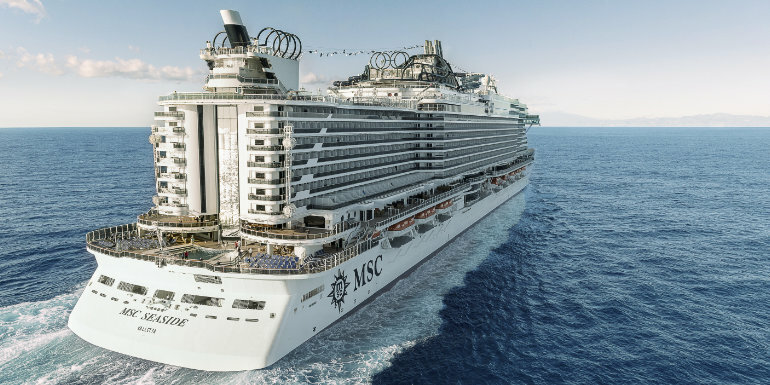 And even at this price point (under $450 for some dates), MSC Seaside is likely to disappoint many passengers until these essential cruise elements improve. The ship itself is stunning, though it feels a bit more mainstream and less plush than MSC Divina and earlier MSC ships assigned to the Caribbean. 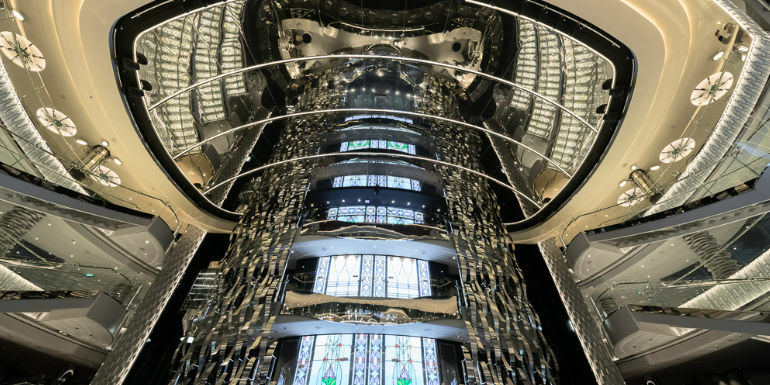 The 3-story atrium represents a breathtaking entry onto the ship, and is bright and welcoming thanks to expansive windows. 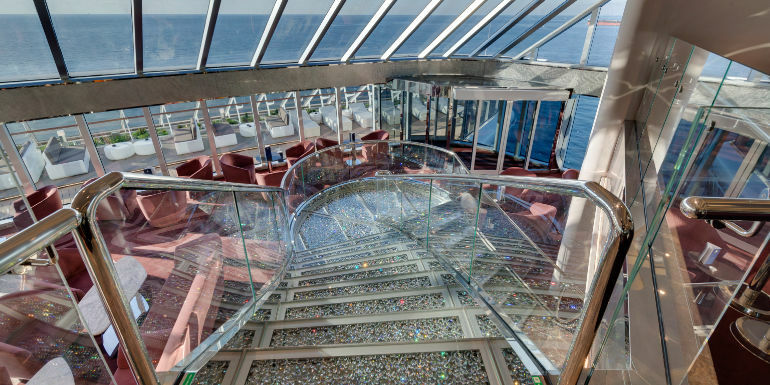 MSC's signature Swarovski crystal staircases add even more sparkle. There are bars, shops and seating areas to explore and discover on every level of the atrium. The ship's overall layout is a little bit confusing, with lots of dead ends and many mirrors that make smaller spaces look larger but that also cause confusion. Savvy passengers will be undeterred and grab their deck maps and go exploring, as there are many nooks and crannies to explore and discover onboard. In some ways, the ship is reminiscent of Royal Caribbean's Oasis class, with lots of small spaces to spread out the crowds. MSC promised more outside deck space per passenger on Seaside, and it would seem that they delivered. There are plenty of lounge chairs to be found, 3 outdoor pools (1 of which is reserved for guests in the swanky MSC Yacht Club) plus the indoor Jungle Pool. The aft South Beach Pool complex and the recessed staterooms that overlook it, the most-publicized design features of the ship, seem a bit underwhelming while on the ship, but create a striking, unique external profile. MSC Seaside cracks open the buffet mold, with two buffet options onboard, and mixes things up even more by placing the Marketplace, the main and largest buffet, on deck 8, with Biscayne Bay, a smaller buffet with a more limited selection, poolside on deck 16. We're curious to see how cruisers adapt to this change, as the Marketplace was uncrowded during embarkation on our cruise, but the Biscayne Bay was overflowing. There is expansive outdoor seating outside the Marketplace on deck 8, thanks to the waterfront boardwalk that circles the ship. Stealing inspiration from Princess' SeaWalk, MSC Seaside is home to three different outdoor, glass-bottom walkways, including the 131-foot high Bridge of Sighs, that let brave cruisers walk high above and peer down at the ocean and decks below. MSC for Me, a digital cruise enhancement that includes wristbands and a mobile app, promises custom-tailored advice, assist with navigation around the ship, provide digital concierge services and help keep track of passengers' children as they explore the ship. MSC for Me was not active during our preview cruise, so we didn't have an opportunity to try it out. Three pools, four waterslides (including dual Slideboarding slides) and the Forestventure Aqua Park, with five water attractions, make up the water features onboard. MSC Seaside sports two 344-foot long zip lines, billed as the largest at sea. 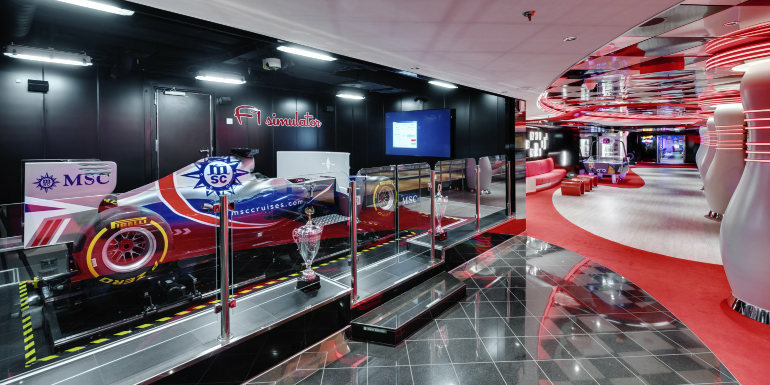 MSC is known for their Formula 1 simulator experience and interactive theater attractions, and both are found on MSC Seaside. More typical cruise activities, like themed dance parties -- don't miss the brief, themed teaser shows (ala "A 70s Moment" or "A Gatsby Moment," etc) in the atrium, occurring once or twice a night to get in the mood -- and more round out the activities. MSC Seaside boasts an impressive roster of bars and lounges, many of which feature live entertainment, like the Silk Jazz Trio, Caribbean Fusion and The Patrick McCarthy Band. The Aurea Spa is an authentic Balinese spa and offers a spacious gym, spinning room, dedicated yoga area, nail salon, barber shop and thermal area in addition to traditional spa treatments. 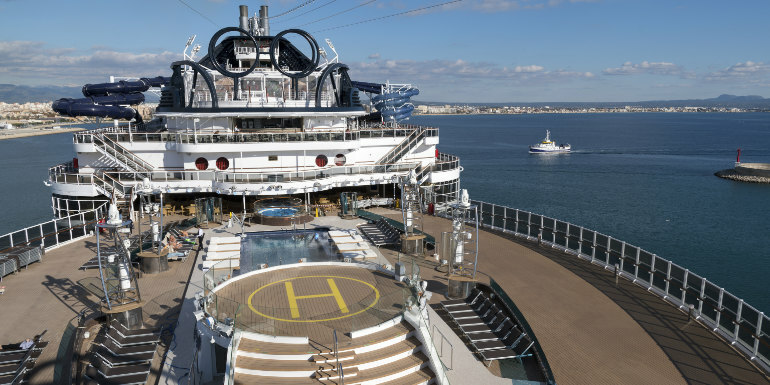 MSC is known for onboard entertainment, and MSC Seaside is no exception. The modest 934-seat Metropolitan Theater hosts 7 new full-scale Broadway-style productions on every cruise, including Peter Punk, a new conception of the classic battle between Peter and Captain Hook, and Butterflies, an original, abridged interpretation of Madame Butterfly. Up to four show times will be available each evening to ensure all guests have the opportunity to attend. Beer Prov, a legendary improv comedy troupe from Canada, will take to the Metropolitan Theater stage late nights for made-up-on-the-spot scenes inspired by audience suggestions. The bar-top atrium stage, with a 3-story LED feature screen and frequent entertainment creates a fun, active vibe in the center of the ship. 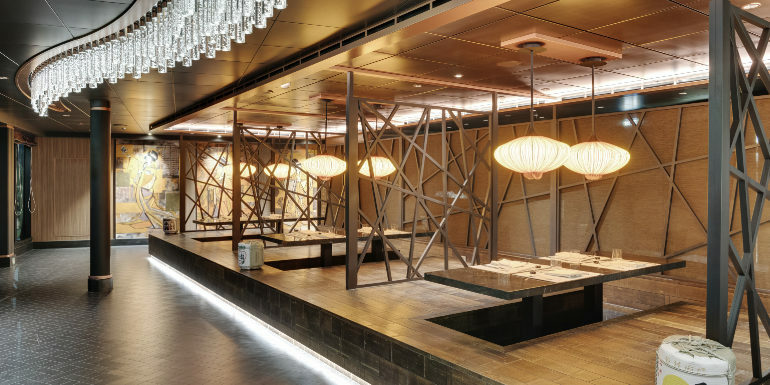 MSC Seaside features 11 dining options including two main dining rooms with two fixed seatings each night, two buffets and four specialty restaurants, including Asian Market Kitchen by celebrity chef Roy Yamaguchi. Food in the main dining room, in our experience, was average to above average, and on-par with Norwegian Cruise Lines' offerings. Service however, was lacking, with water glasses sitting empty for extended periods, bread service slow (or non-existent) and a crew that seemed generally overwhelmed. Food in the buffets was overall, below average, though some dishes did stand out. The selection was adequate, and multiple stations offering the same choices in the Marketplace was welcome to reduce waits and spread out the crowds. Still, the layout of some stations was nonsensical. For example, on the salad stations, the dressing was placed before the lettuce and other salad fixings, making it necessary to circle back to utilize it, causing unnecessary congestion. Signs indicating the items were placed at an odd angle on the "sneeze guard," making it necessary to be very close to each station to read, also causing congestion and some pushing. Many ice machines/drink stations did not work or were turned off in the Marketplace, making it a frustrating experience to find a beverage at times. Service in the buffet was good, with crew members often proactively opening doors or offering to carry plates when the need arose. Trays in the buffet would be a welcome addition. Asian Market Kitchen is the marquee specialty restaurant, with three dining areas and menus designed by Roy Yamaguchi. Teppanyaki offers traditional teppan dining on four table grills. Asian Fusion brings a la carte gourmet Asian fare and Sushi is a traditional sushi bar with fresh sushi, sashimi and tempura. Ocean Cay seafood, Butcher's Cut steakhouse and the charming Parisian-stye sidewalk cafe Bistrot La Boheme round out the specialty dining choices. 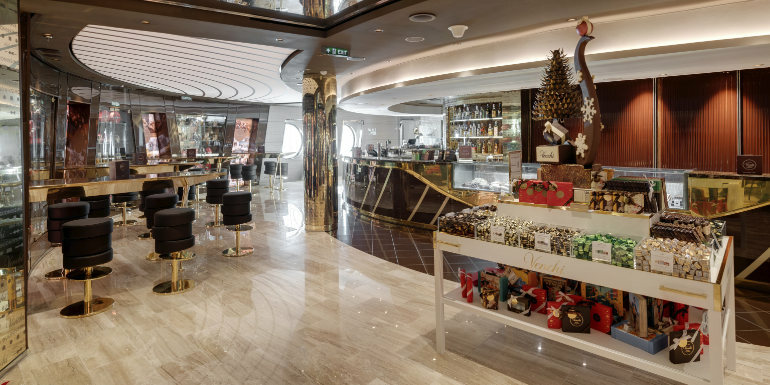 Venchi, the famed European chocolate and gelato maker, is well represented on MSC Seaside with multiple gelato stands and a dedicated chocolate bar and boutique that caters to your sweet tooth. As we suggested on MSC Divina, a gelato flight would be a perfect to sample multiple flavors. MSC Seaside offers over 1800 staterooms across 20 categories, 73% of which offer a private balcony. In addition, the ship boasts 216 suites, 81 of which reside in the swanky ship-within-a-ship MSC Yacht Club. MSC stateroom categories include different amenities depending on the stateroom category and "experience level" booked. Guests in the Bella experience receive fewer amenities than guests who book "Fantastica," "Wellness" or "Aurea" experiences. 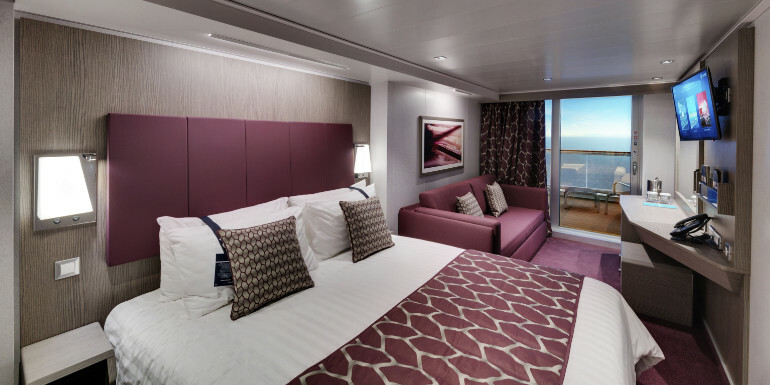 Modular, connecting balcony stateroom combos are available for families. Our B2 Balcony, designated as a "Fantastica" experience, included a choice of early or late seating times for dinner, free room service from 6 am to 11 pm, free breakfast in bed, discounts on fitness classes, and more. The stateroom itself was a typical cruise ship balcony cabin, with two notable exceptions: the bathroom featured a full-size tub instead of a shower, and the closet space was very small. It's hard to imagine even two passengers fitting clothes for a 7-night cruise in the limited space provided. Three USB charging ports were a welcome find, though it would have been appreciated to have one on each side of the bed. In a bit of a quirk, no washcloths were provided in the bathroom, even after a request to the stateroom steward. The MSC Yacht Club offers a private pool, sundeck, bar, and restaurant for suite passengers willing to pay a premium for a club-like experience. Kids 11 years and younger sail free on MSC, so the line attracts lots of families. 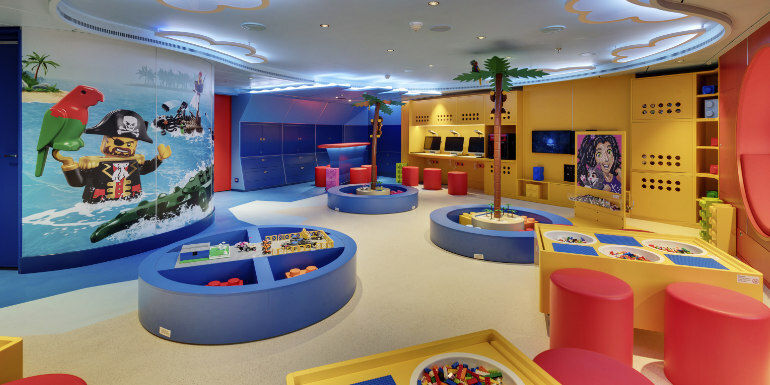 MSC Seaside is ready for them, with six areas dedicated to different age groups, including a Baby Club and the two LEGO-themed spaces for different age groups. The DOREMI Studio is an exclusive lounge for families to have fun together, and on port days, one kids club will be opened to both parents and children to allow for even more fun as a family. Several times per cruise, the Metropolitan Theater will show family-friendly movies as part of the DOREMI Family Cinema program. Are you considering sailing on MSC Seaside? We are booked for March 3, 2018. We loved the Divina and wanted to try a new ship. We go with an open mind and realize that everything will not be perfect, especially on a new ship and its first cruises. We were considering Seaside, but re-evaluating now. From the statements of others, is the value worth the lack of service and quality of food? durblanks - it really depends on what is important to you. You'll likely still have a good time, but if food and service are critical points for you, it may not be.